1933 Goudey #135 ELWOOD (WOODY)ENGLISH - Chicago Cubs / (GD) - Crease-free! 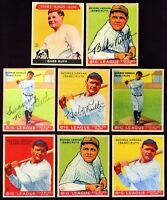 1933 Goudey BB #237 Gus Mancuso New York Giants FIELD BVG EX 5 !!! $0.00 shipping for each additional eligible item you buy from deans_cards.